For the past weeks, a video of three friends had been circulating around the Facebook. Samir, King and JhongBMP as they call themselves now is comprised by three high school friends, Samir, King and Jhong, from Bai Matabay Plang Village in North Cotabato. They were known in the video singing Air Supply rendition and ‘Let Her Go’ at a front of a store with chicks and other voices in the background. With their video going viral, BMP, originally called ‘Three Friendly’, were invited to be featured in ‘Unang Hirit’ on Sepetember 2, and interviewed in ‘Kapuso Mo, Jessica Soho’ of the GMA Kapuso Network. When they were asked if they were willing to leave Cotabato for stardom, Jhong shyly said no. 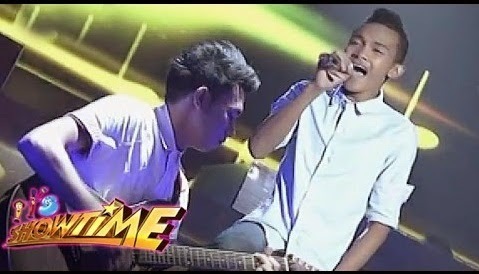 Tuesday, on September 9, the schoolmates wowed Madlang People in ABS-CBN Kapamilya Network’s noontime show ‘It’s Showtime’ in the PINASikat segament. Jhong Madaliday, the vocalist of the group, sung the Air Supply’s song ‘Having You Near Me’ and owned the stage. Jhong Hilario expressed his excitement as he talked to the boys. He admitted that he saw their viral video that was uploaded and wanted to personally invite them on the show. As it turned, and much to his amazement, they were already on the show. He said that he thought they did also did well with their other videos. Their videos were originally uploaded by Zacky Kandalayang on YouTube. While the vocalist was said to have a pure voice, the guitarists also were equally talented. Because of joining the show, more people had known them. Jhong Hilario even promised to buy a record if the group would one day produce an album. It is certain that these kids have talents, and if given opportunities, they would go far and make Filipinos more proud.